no price advantage over the real thing that happens to be a great product. and at about 40 HP at the rear sorry, V7 any time before this. in addition they raised the Versys 1000 from $12995 to 17995 by adding a few gizmos found on their other bikes. THEY ARE NUCKING FUTS!!! Whoa! I seen they updated it but didn't catch the price. I paid $11,400 for my brand new '16 Versys 1000LT in '16. A $6,000 premium over that is insane. I could see maybe paying an extra $2,000 for the electrically adjustable suspension. LED lights are cheap. The TFT dash is nice but not necessary. These bikes aren't popular which makes 'em hard to sell. I tried to sell it last summer and couldn't even get $6,000 for it. Knowing that really puts a limit on what I'd pay for one now. I predict that the W800 will out perform, be more comfortable, and more reliable than the new RE twin. 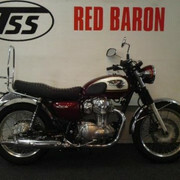 Yes, I rode a W650 for ten years - loved the bevel and 8 valve engine. I think I'd take a V7 III over these as well. When I went to but a V7 III it was parked next to the new Bonneville T120 - I rode both and came home with the Bonneville, so far, no regrets. Not at all interesting to me, looks like another copy job from Japan. Meh. 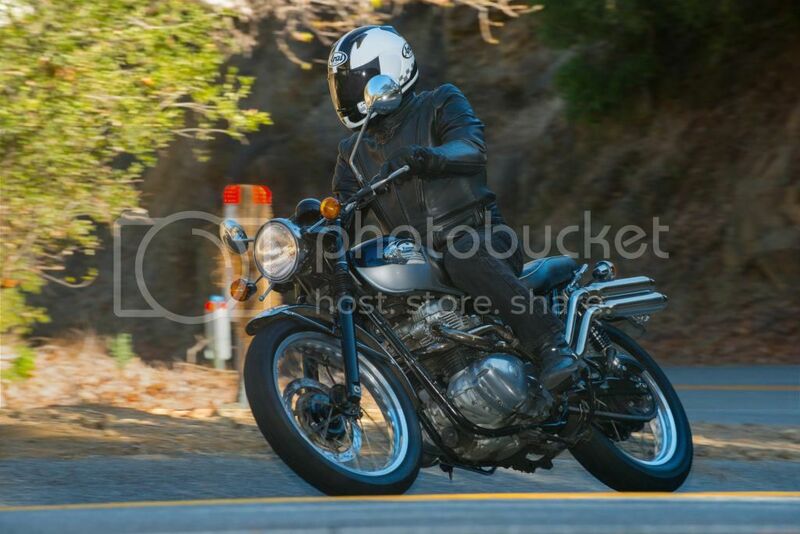 Looks like we both liked to do some light touring on our W650s. 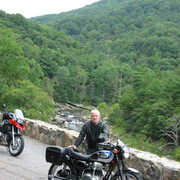 Here's a pic of mine, taken in September 2006, riding along Rt 39 in Virginia, overlooking the Maury River, which runs through Goshen Pass. Purchased new in August 2000. Approaching 50,000 trouble-free miles in Sept 2006. A well-built machine. I like it. Not crazy about the color. Always dug the W650. Not a copy. Licensed production in another country. More like Royal Enfield than Triumph, the sequel. Well, it looks like Kawasaki are producing a regular W800 as well, but, we may or may not get it in the US, as the US Kawasaki site only shows the cafe. Hopefully the offer it in gloss paint as well. As others have said, I think the all black engine does detract some from the looks of these bikes. They should at least polish the edges of the fins like they do on the Cafe. They look SO much better in gloss paint, and with the engine in silver with polished side cases. At least it has a tach, unlike the V7 III Stone. At nearly $10k, I do think the price is about $2,000 too high. 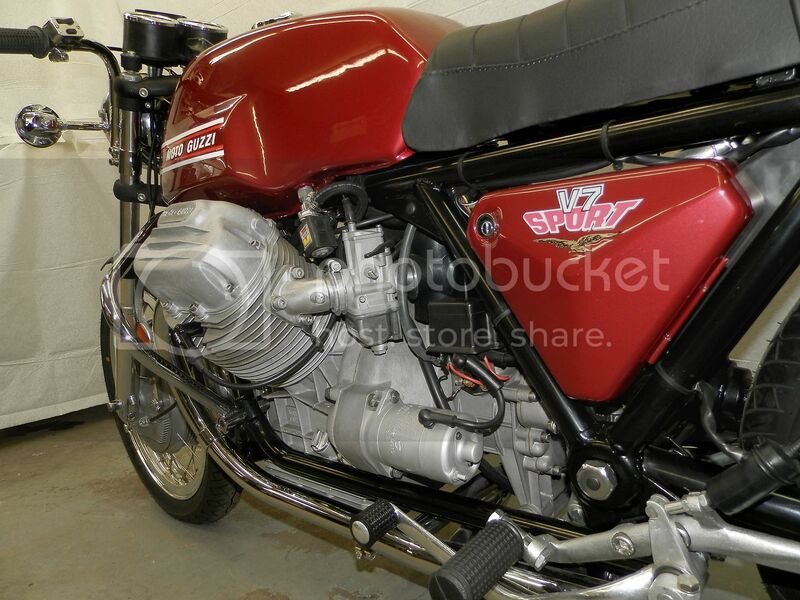 The Guzzi V7III's are a much better deal. At $10k, these will languish on dealer floors like the Honda CB1100's did, and will be sold as 2-3 year old models for $7k. Due to this, Kawasaki will discontinue them promptly, and not attempt to import them to the US again. jas67, I have to agree with everything you said. they've got a hit on there hands.. I like it, the brown seat insert flows into the brown tank and silver side panel and fairing is a nice contrast. It will probably be super reliable, comfortable with plenty of power, I hope its a hit for Kawasaki. Canada will get both versions of the bike, $11,499C for the Cafe, and $9,999C for the standard. So, with the US price for the cafe set for $9,799, that would put the price for the standard, if we get it, at around $8,499. I do think that only offering the Cafe in the US is a mistake. I would think that they'd sell 3 standards for every Cafe. The Cafe looks cool (s**t brown color notwithstanding), but, I'd rather ride the standard. I know, I've had a V7 Racer for 5 years, and during 3 of those years also had a V7 Special ('14 for 2 1/2 years, and the '17 for a half a year). The Special always got 3-4X the miles on it. If I had neither, given my experience, I'd buy a Special over a Racer, and, likewise would buy the standard W800 over the Cafe. That said, I'm sure they're hoping to engage the younger "hipster" crowd, and I hope they do, otherwise, see my previous post for the outcome. I would think your version would sell much better. But what do I know? Must be the only one, but I think it looks pretty cool..
Nah, I like it too. So does Jenn. We're casually looking at Bonnie's. I wonder what we will dislike more their water-cooling or this tubed-spoke wheels. Easy call for me......I can live with spoked wheels, but not water cooling! Yeah and then blame the soft US market for all future standards. Other brands will quote it as well. When we all know a glossy W800 or CB1100DLX at $9999 woulda sold. That W800 lookis nice, really nice. I think Kawi missed an opertunity by not bring it to the US earlier. They could have could have rode the rising wave of retro interest. Kawi. Sales rep was there meeting with the GM and the sales manager. Seems the dealer will soon be a Kawi dealer. The sales manager confirmed he has a W800 on order. Probably not a bike I'll buy at this point but would like to lay my eyes on one. Although my 2014 CB1100 originally retailed for slightly over $10k, I picked it up in April of 2017 for $6995, plus tax and doc fees. Total: $7190.00. Came with 12 month Honda warranty. 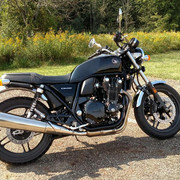 One of the CB1100 forum members picked up a leftover 2014 this year, and added a 5 year extended factory warranty, all for approx $7000. Whether you like the machine or not, that's a lot of bike for the price. Although it took a while, I'm starting to appreciate and enjoy this Honda retro bike. Sure, it weighs slightly over 500 pounds, but on the relatively narrow tires she is docile, and though rated at only 88hp, makes really good torque throughout the rpm range. Seems something like this is wanted? I read in one of the intro articles that the US would be getting both eventually. I assumed it was a manufacturing capacity issue. I'm surprised they are both offered in CA and not here, as the homologation process is practically the same. One would think that Kaw would have amortized the cost of the W650 and W800 series over the past 19 - 20 years, Euro 4/5 aside. Yes, but according to the press releases this is not the W650/W800 we know. 90 % of the engine are new according them, and a new frame is mentioned. If we are unlucky this is another 270 degrees twin. One should leave that to real V-twins and build parallel twins instead. BUT, I'd rather own and ride the W800, as it is a known quantity from the reliability standpoint. Of course, the W800 is nearly twice the money. To me... that is beautiful! Clean and classic. The seat looks just a fraction under done, but another disc and it'd be damn nice..
Well that's probably stating the bleedin' obvious, but the Kawasaki looks as ugly as a slapped arse..! That RE is bordering on nice, almost to the point of being desirable. I tell ya, if they bring that street model to the states...I would add a Dart Flyscreen, K&H 1" taller seat, and H&B C-Bow mounts, and I would be good to go. Tres chic! Agreed! I would hope Kaw has retained the 360 degree crankshaft. Change whatever else internally to improve the engine (if any improvement is necessary! ), but keep the 360 firing order. It's the real deal when it comes to retro vertical twins. My 2000 model sounded pretty good with the stock pipes. 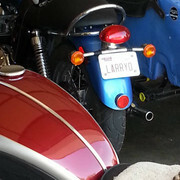 Left them on for the 50,000 miles I rode the W. When I picked up a 2003 790cc Bonnie, it was sooooooo quiet. A set of Triumph's TORs cured that issue for me.